Shall I Knit You a Hat? Kindergarten-Grade 2�CA sweet tale of gift giving and friendship. 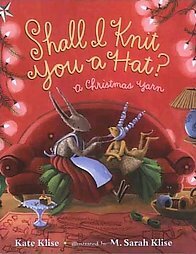 When Mother Rabbit hears that a blizzard is expected to hit on Christmas Eve, she knits Little Rabbit a hat that shows off his long, beautiful ears. He loves it, and suggests that they give their animal friends hats as Christmas presents. 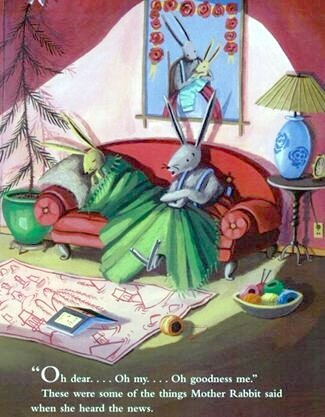 Mother Rabbit agrees, and the two set off to take stealthy measurements, then carefully craft the hats to suit the personality and physical attributes of each animal. The finished products are, well, creative; the expressions on the animals' faces as they view their gifts in a mirror are priceless. However, when the snow begins to fall, the recipients quickly realize that their presents are just what they needed. This is a good selection for holiday sharing, but the detailed acrylic illustrations cry out for close inspection and would work best one-on-one or with a small group. [This review was first published in the "Ephrata (Pa.) Review."] A blizzard is blowing in but Little Rabbit is ready. His mother has knit him a cozy hat. Little Rabbit worries about his friends, however. He suggests they should receive hats for Christmas too, an idea Mother Rabbit seconds. Little Rabbit designs headgear appropriate to horse, goose, cat, dog, squirrel and deer. The friends aren't sure what to make of the quirky hats--until they see just how toasty the custom designs keep them. This snug story of friendship and mother-child love encapsulates the Christmas message that giving begets joy.